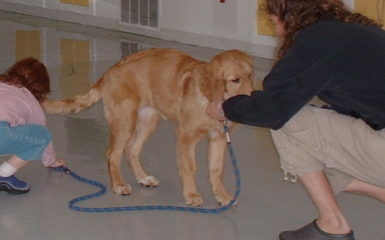 One of the number one obedience behaviors our Salt Lake City dog training clients want to train is loose leash walking. Walking a dog that pulls on the leash can not only be painful physically but it can also be painful psychologically. A dog that pulls on the leash can be frustrating for many dog owners. As a result, we decided to discuss how to train your to walk loosely on the leash. 1.) Set you and your dog up for success. Your dog will learn much faster, and the training will be much easier if you create an environment that is conducive to success. Begin by walking your dog in low distracting areas. 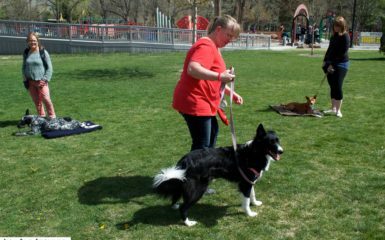 When performing dog training, Salt Lake City has many on leash dogs parks where you can walk your dog. Save these dog parks for more advanced level training. Instead, begin by teaching your dog to walk loosely on the leash inside your home, in your backyard or in a low distracting neighborhood. Before training your dog to walk loosely on the leash, exercise your dog. You can play fetch off leash in your backyard. If your dog has a great recall, you can let him off leash and run. A more tired dog, will more likely walk loosely on the leash. Make sure your dog is hungry. Train your dog with treats before dinner or breakfast. A hungry dog is much more motivated to eat treats! 2.) Practice a good mindset. Remember training takes time. When you feel an emotion such as anger, sadness or fear allow yourself to shift to an emotion of a higher vibration. Your dog will be more responsive if you are grounded. A great way to shift is to ask yourself how and wonder questions. How can I be a team with my dog? I wonder how I can have fun on our leash walk today? How can I create my dog to listen successfully? I wonder how I can make training on the leash easier? 3.) Use a front hook harness or a head collar. Both of these apparatuses are great to support your dog to pull less on the leash. Make sure you still use obedience training techniques with these apparatuses. We recommend the Softtouch Front Hook Harness and the Gentle Leader head collar to many of our Salt Lake City dog training clients. 4.) Stay away from using any pain-based training methods. These methods include: shock collars, prong collars, choke collars etc. These apparatuses can create your dog to develop fear or aggression issues. They are not pleasant feeling for your dog. 5.) Keep your walks short. In the beginning, it might be easier for you to take 2-4 short walks a day. Each walk can last about 5-20 min. As your dog gains obedience on the leash, begin to lengthen your walks. 6.) Enjoy the training journey rather than being attached to the destination. Walk for a certain length of time rather than being attached to reaching a certain location. 7.) Change directions when your dog pulls on the leash. 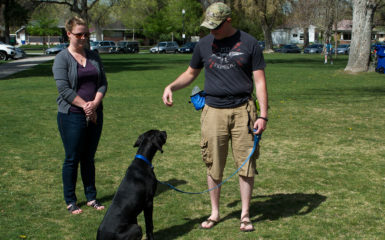 Many of our Salt Lake City dog training clients love this method. When the leash is loose click and treat. If you are consistent, your dog will learn that tension on the leash means that you are going to turn and go into the opposite direction. He will also learn that if the leash is a loose he gets reinforced by walking in the direction he wants. 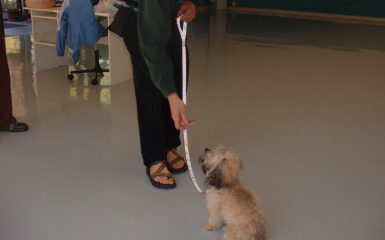 Click here to read more training loose leash walking. 8.) Use treats that are motivating to your dog. Due to distractions, most dogs will not work for their kibble on outside walks. Soft treats such as Freshpet are great to use for dog training! We also love Paw Paws Pet Boutique as they sell many healthy training treats! 9.) Lastly if it is extremely frustrating to teach your dog on your own, receive some support with a professional dog trainer. 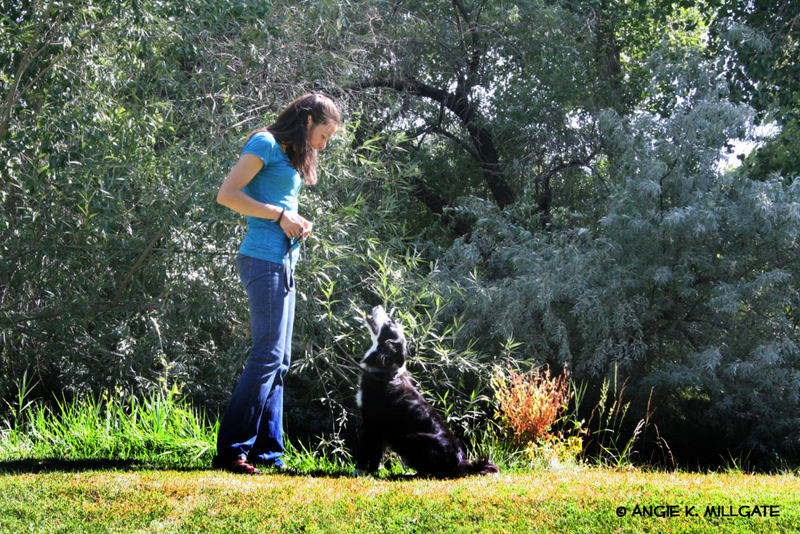 Utah has a website with a list of many positive reinforcement trainers to choose from. If you live in Salt Lake City or would like to do sessions via Skype Four Legged Scholars dog training, Salt Lake City would love to support your dog training needs. We have a new leash walking group course starting soon! We want to hear from you! Does your dog walk loosely on the leash? If no, what techniques above will you apply to create loose leash walking success? If yes, what techniques did you use that worked for you and your dog? He doesn’t pull as much as he used to. He’s improved with age, but taking bike rides has also helped him learn when it’s ok to pull. I have very bad shoulders, so pulling isn’t good. So I’ve been trying to teach him not to pull. One thing that hasn’t helped is the coowner’s insistence on using a retractable leash. You know the ones that are 9-24 ft long and roll up inside a handle. Interesting article. I grew up with a variety of animals on a farm. Yes we had dogs and they often worked on the farm and didn’t go to dark parks. They didn’t always get treats when they were being asked to do something. They were well behaved and very seldom had a stern voice raised, rather treated with a mutual respect. I enjoyed your suggestion about being awareness and teaming with the dog. Thank you so much for your reply! In regards to psychology a dog or any animal will perform a behavior or not depending on the consequence they receive. So if they are receiving something that they want (treats, praise, attention, running, play etc) or avoiding something that they do not want to happen (yelling, being sprayed with water, being shocked, being jerked with a choke collar, etc.) they will perform that behavior frequently. This is basic psychology. I am understanding that your dogs performed the behaviors without treats so they were receiving some mutual benefit that encouraged them to perform the behavior. In Four Legged Scholars we only use positive reinforcement and never use any pain based methods that I have described above 🙂 Just a little perspective to get into your past doggie’s brain! Namaste!